Our previous visit to Daroji was awesome, but had us wanting more. This place thus remained on our must-visit list. This time around we chose to do things a bit differently. We drove down instead of taking the train. (Note: Having one’s own vehicle is really useful). Our friend Alwan (fellow INWian) joined us. Santosh Martin (fellow JLR NTPian) helped with accommodation and logistics. Samad Kottur’s guidance too was invaluable. 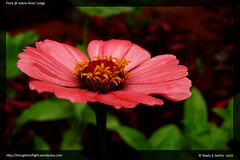 Thanks Santosh/Samad. Contrary to our apprehensions, the drive was rather smooth. The total distance from Bangalore to Hospet is around 330 kms – 200 kms of excellent roads (NH4) to Chitradurga and 130 kms from here on to Hospet. Barring a 10-15Km stretch, the roads were fairly good. End to end, it took us 7.5 hours (including breakfast/birding breaks). 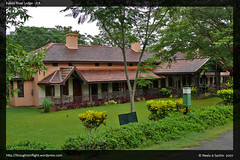 We stayed at the Kamalpura forest rest house, ~15 kms from the bear sanctuary. The food provided by the rest house staff was really good and economical. The stay was comfortable indeed. Excellent sightings of the bears inside the sanctuary from close quarters. We even got a glimpse of a cub piggybacking on the mother. Piggybacking behavior can be seen in Feb-Mar but apparently, there were a couple of late cub arrivals this season. Good for us :) Did not get too many shots though since it was very very brief. Inside the sanctuary, we also got to see and make images of the Ruddy Mongoose, Peafowls, Painted Spurfowls, Grey Frankolins, Jungle Quails and other birds. 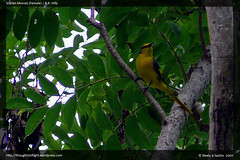 Visit to Hampi(Mathanga Parvatha in particular) in search of the Yellow Throated Bulbuls. We saw quite a few of them but they were very skittish and not easy to photograph. Also got to see many other birds such as Grey Hornbill, Shikra, Common Hawk Cuckoo and others. Hampi looks so nice that probably should make another trip just to visit the ruins of Hampi. A drive along the High Canal road on the first evening led to the much-awaited sighting of the Eurasian Eagle Owl (same as Great Horned Owl and Bubo Bubo). The road is not tarred and the ride was bumpy, but the was really beautiful with the canal on one side of the road. We also sighted a Barn Owl along this road. The lake along the main road in Kamalpur yielded excellent sightings of Pied Kingfishers and Pheasant Tailed Jacanas on all the days of our trip. All in all, a very enjoyable and relaxing trip. The weather was very nice and the lighting was good enough to make many memorable images. On June 28th, we joined Alwan, Sreeraj, Mandar and Shrikant for a trip to the Jayamangali Blackbuck Sanctuary in Maidenahalli. 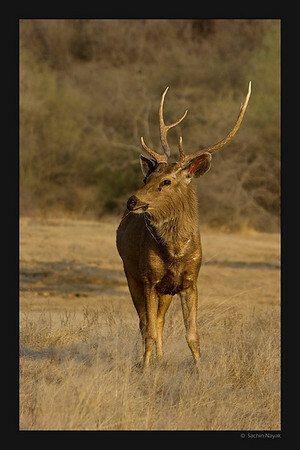 The sanctuary is around 140 kms from Bangalore. We left very early at 4am. Supposedly, it is easy to get lost on the way but the others had been there before so it we reached the place easily at around 7am. 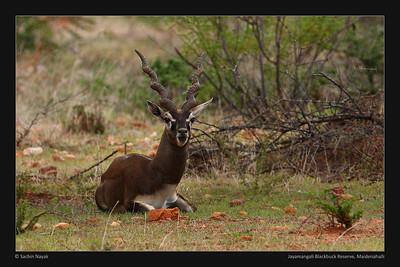 Most blackbucks we saw were in the grasslands before entering the reserve gates. They are very skittish and run away at the first sight of humans. We realized later that they best way to photograph them was probably from within the car itself. Later we came across the carcass of a male backbuck. The body seemed fresh (suggesting a recent death) and did not have any wounds/marks. We could not ascertain the cause of its death. As we waited, a pack of dogs (7-10) started circling this body and one started feeding on the body. 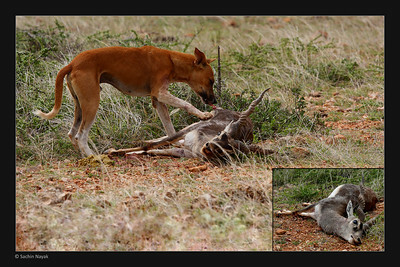 We were wondering whether the dogs had killed the blackbuck. Later, experienced INW members suggested that the death could be because of the snake bite. 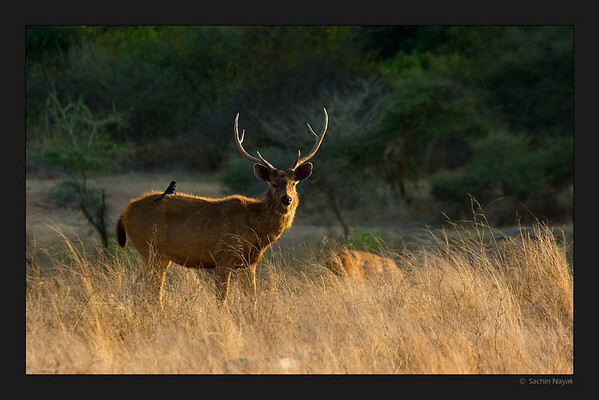 Apparently, dogs are known to chase blackbucks but they can’t physically overpower an adult blackback. They do manage to kill/maul fawns though. 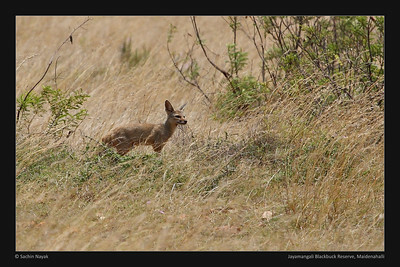 While stalking a group of blackbucks to get a decent image, Sachin saw a fox run across the grassland. 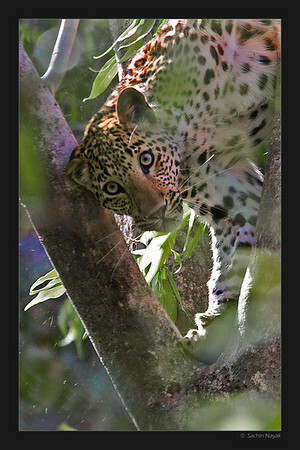 He managed to get a few record shots as it paused momentarily before disappearing into the bushes. As he went into the bushes in search of the fox, he came across two black-naped hares. The fox was not seen again though. We were hoping to see some raptors but were not very lucky. Just managed brief sightings of the Egyptian Vultures (circling over the carcass) and a solitary White-eyed Buzzard. We left the sanctuary in the afternoon and reached Bangalore in the evening. It was tiring but a very satisfactory trip. 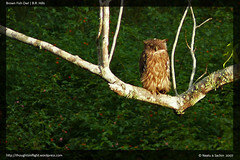 Having seen wonderful pics from the INW07 meet at Dandeli in Feb 07 (before we started birding), we decided a weeklong birding trip to Dandeli/Kulgi/Ganeshgudi from 25-30 December. We travelled to Dandeli via Kumta and thus did not have our own vehicle. For the first couple of days we stayed at the Hornbill River Resort (6 kms from Ganeshgudi, adjacent to the Bison River Resort). 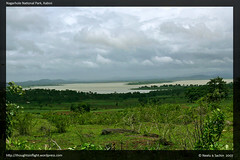 The location is unbelievably beautiful and offers amazing view of the Kali river. The morning views are stunning when the mist from the river creates a magical effect. 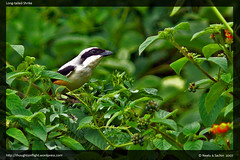 True to its name, this place offer excellent sightings of the Malabar Pied Hornbill and Malabar Grey Hornbill. 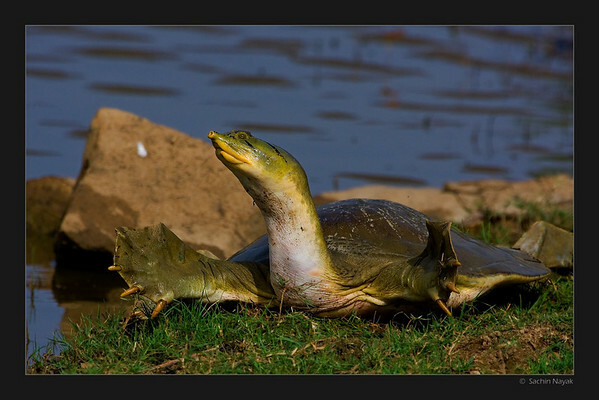 Both are seen in abundance within the campus feeding on fruits. Another must-watch here is the Hornbill Crossing – a routine of these majestic birds crossing across the Kali river every evening. Across the river one often can see the Lesser fish eagle and the Black-capped Kingfisher (amongst other birds). These are best seen on a boat/raft ride. Besides birdwatching we also experienced the adrenaline rush of river rafting here, traversing through some 10 rapids (3+ grade) on the Kali River. Kulgi nature camp was our second destination where we camped for 3 nights. This is probably the best place to camp around. 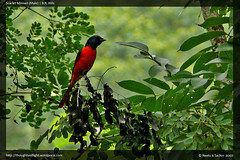 The camp is situated in the forest and is a great location for birdwatching. You can see birds practically everywhere (behind the tents, enroute the watch tower, Inspection Bungalow). The best experience we had were with the mixed hunting parties when for 10-15 mins birds of different species are seen in large numbers. Typically this includes Drongos, Woodpeckers, Nuthatches, Starlings, Babblers amongst others. In addition to these we had good sightings of Woodpeckers (Greater-flameback and Yellow Crowned Pygmy) and our favourite – Asian Paradise Flycatcher right behind our tent. 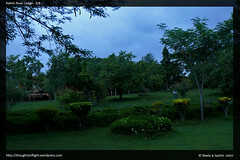 The forest department offers jungle safari here, but ours (like most evening safaris here) did not prove very productive. Our lone sighting was a Gaur (which most others did not). 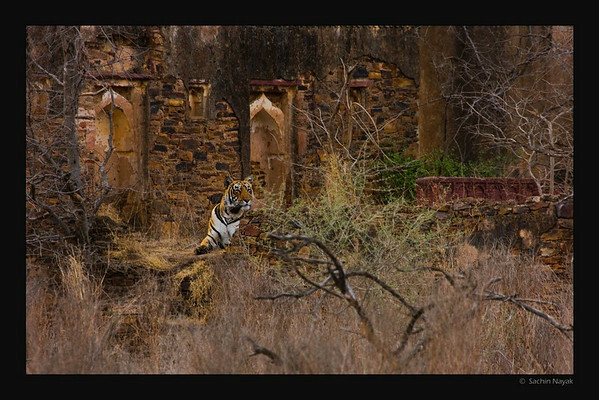 Though one can supposedly sight the black panther and the tiger in this sanctuary, we did not come across a single deer/chital. Besides the surroundings we visited the backwaters of the Bommanahalli dam and the Dandeli Timber mart. 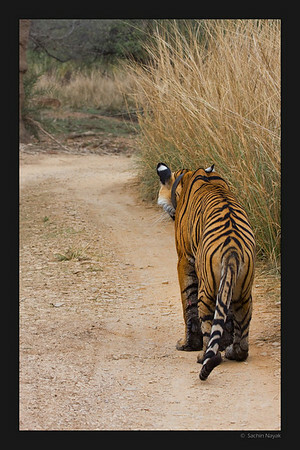 The former did not yield any special sightings and was a bit of a letdown having walked 7 kms in early hours of morning. The later was a great place to sight the hornbills but our experience was slightly truncated by heavy fog early morning. 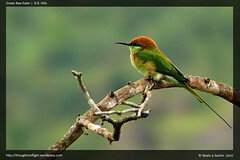 Nevertheless this place offered great sightings of the Roller, Barbets and a number of small (still unidentified) birds. For birdwatching, it really helps to have your own vehicle here. Not having one imposed a major constraint for us. Private transport (typically Jeeps) is exhorbitantly expensive. Public transport is cheap but intermittent. Distances are long. More often than not distances are much greater than those indicated by locals. Hornbill camp offers tree house, log huts, rock huts and rooms at the same cost (please verify). 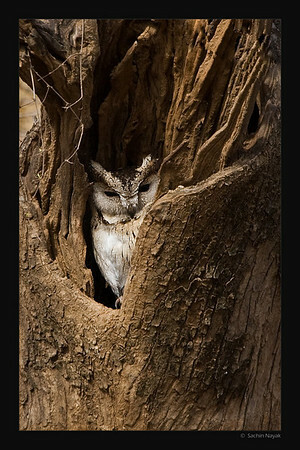 Try to book the tree house, it is excellently located. The standard rooms are a pithy in comparison. 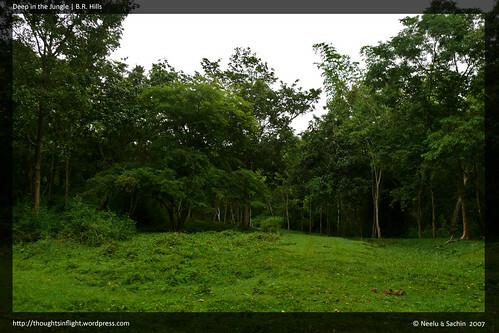 Bookings for the Kulgi Nature Camp need to be made through the forest department in Dandeli (Phone-, Fax-). Advance payment towards accomodation must be made via a draft drawn in favor of “The Deputy Conservator of Forests, Dandeli”. State Bank of Mysore has a branch in Dandeli. Kulgi Nature camp is very economical. It offers standard/deluxe tents in addition to dormitories. The deluxe tents come with attached toilets. All tents have electrical points for charing camera batteries/laptops. Though cheap, Kulgi Nature Camp offers very clean accomodation. Remember to carry your own towels and toileteries. Reasonably good food is available in the campus at a additional cost. There is no mobile network/phone connectivity at Kulgi. 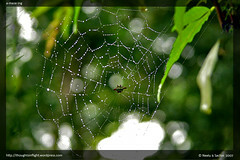 The temperatures at Dandeli, Ganeshgudi and Kulgi can vary. For us, Ganeshgudi was very cold in comparison to Kulgi. We finally made our long awaited trip to BR (Biligiri Rangana) Hills last weekend. We took Monday off to make a long weekend out of the October 2 holiday. Like on our previous trip, we broke our trip in Mysore, spending a night there. Early morning, we went back to Kukarahalli lake. It again turned out to be a very nice birding session with no rain this time. Along with the birds we had sighted last time, we had our first sightings of the Black Ibis and the Bronze-winged Jacana. Another thing to note was the huge number of Spot Billed Pellicans and an almost complete absence of Painted Storks (we spotted just one). After breakfast, we left for BR Hills. Took the Mysore-Ooty road towards Nanjangud, after which took a left turn to go to K.Gugi wilderness camp via Kamrajnagar. The road was decent in most places, except for a bad patch of around 3-4 kms due to some road construction work near Nanjangud. 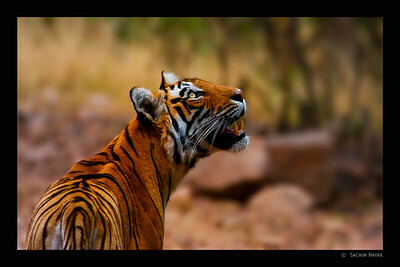 Right after the entrance to the park, a drive of around 15 kms took us to the K.Gudi wilderness camp. The highlight of the trip this time was the sheer beauty of the place. Picturesque landscapes (probably the best we have seen yet) greeted the eye through the entire duration of our trip. 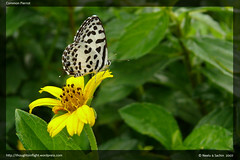 The monsoons have left the forest green and beautifull. JLR property at BR Hills is quite different from its other properties. The area is more pristine; almost in the middle of the jungle. 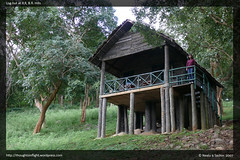 We had booked a log hut (Biligiri) which was located almost at the end of the camp. Just sitting in the balcony of the log hut provided a splendid view of the nearby hills. The number and type of birds seen inside the camp itself were amazing. Just after our first lunch (after checking in) in a span of 3-4 minutes we had four lifers just behind the Gol Ghar. We could see birds flying everyway, we could not decide where to look. It was over in a few minutes and the same birds were not spotted at that place again. On the safaris into the forest over two days, we saw a huge number of deers (spotted, barking and sambhar), a couple of Indian gaurs, two herds of wild elephants, a number of wild boar, couple of Malabar Giant Squirrel, a mongoose and some birds (Crested Serpent Eagle, Crested Hawk Eagle, Brown Fish Owl, Jungle Owlet and more). We were not lucky to get a glimpse of any of the big cats, wild dogs and sloth bear which stay in the 540 sq km sanctuary. But just driving through forest itself in this beautiful weather was very pleasurable. In addition to the safaris, we went on a drive on the main road in our own vehicle towards the entrance of the park. This drive itself yielded a good number of bird sightings. Also a walk around the JLR camp provided the excellent sightings of Wagtails, Minivets and the Nuthatches. Overall, it was a wonderful experience and we are already waiting for our next trip into the forests. After excellent birding sessions on the lakes of Mysore, we started on our drive towards Kabini. 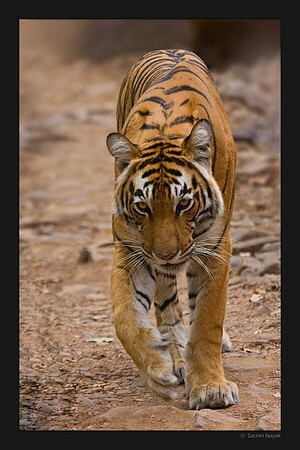 We had been wanting to go to Kabini since a long time but never got a booking there. 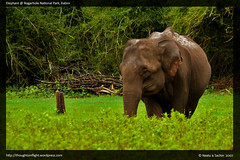 Now that the monsoons are here and the huge elephant congregations are over, we got booking for a day on June 30th. The drive from Mysore to Kabini on Mananthvadi road itself yielded excellent sightings of a Black Shouldered Kite, a few Indian Rollers, Spotted Doves, Bee-Eaters and Bulbuls perched on the wires running along the road. The road was in good condition besides the last 15 kms, which was pretty bad. We did see a mongoose run across the road from a distance on entering the park. When we reached the reception of JLR we met with the disappointing news that the forests had been closed just from that day. We had not known this during the time of our booking but had read in the newspapers later about it. However, we had presumed that the closure was from 1st of July so had been hopeful that we will be able to manage one safari inside the forest. 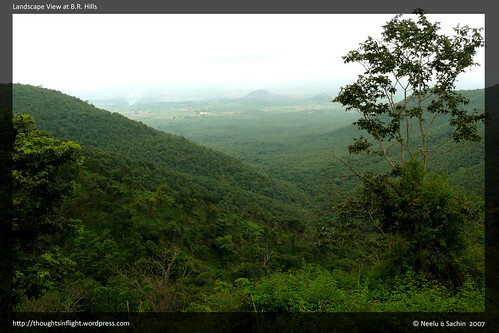 It seems that this is the first time in Karnataka that the forests are being closed in the monsoons. We were informed that we would be taken on a “boat” safari which would take us to the river banks inside the forest and a “jeep” safari the next day along the main roads outside the forests. As compared to other JLR properties we have been to, the Kabini River Lodge seemed much more luxurious and sophisticated. There was a fridge and coffee maker in the room, even the bathroom had a bath tub!! The setup seemed to be targetted at attracting international tourists. Maybe they could have some rooms at a less expensive rate and keep away the additional frills. The boat safari initially seemed nothing more than an oridinary boat ride but as we moved towards the forest, the scenery around us was breath-taking. Dense green forests on all sides with us in the middle of the river gave a totally different perspective from being inside the forest on a jeep. As we moved inside, there were a many bare trees on the river with their branches jutting above the surface of the water. And on top of most of the branches, there were beautiful birds. 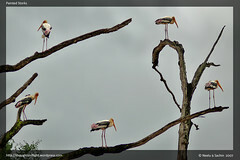 A tree with around 7-8 branches and a single Painted Stork on each branch made an awesome sight. It seemed almost like a painting. Another tree had many Lesser Whistling ducks (lifer). There were many small islands full of birds, one with White Ibis, another with Painted Storks, a third one with many Egrets. On moving slightly ahead, we had the beautiful “Osprey” in full view. 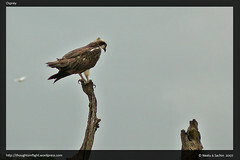 After a few minutes, the Grey Headed Fish Eagle was seen perched on the branch of a tree along the shore. 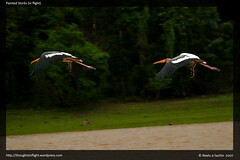 We were soaking in the these raptor sightings when a herd of 10 elephants was seen grazing on the banks of the river. The boat moved closer to the bank for a better view. 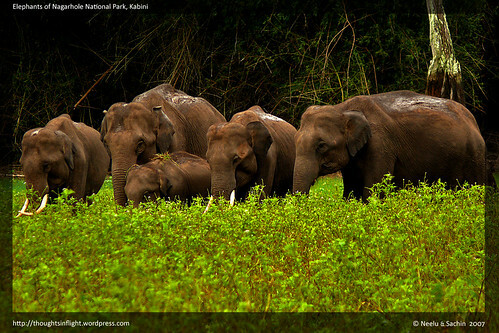 The naturalist told us that there had been no elephant sightings for the last two safaris. 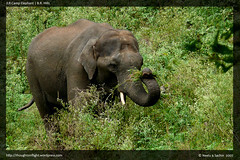 Going to Kabini and not seeing an elephant would have been sad indeed. 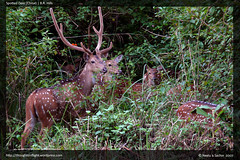 On the way back, we also saw a couple of wild boars and a herd of spotted deer at a distance. Even though our expectations from the boat safari had not been too high, we enjoyed ourselves immensely. 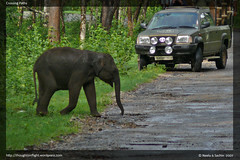 The next mornings Jeep safari was on the main road, the one we had taken to reach Kabini. We spotted the Booted Eagle (lifer), Crested Serpant Eagle, Peafowls (without the dance), a few Flamebacks and the Grey Junglefowl. An interesting incident happened though. 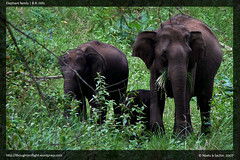 A herd of elephants could be seen behind the bamboo thicket and all the jeeps were watching it. It seemed that the herd wanted to cross the road so the four jeeps moved back to make way for the elephants. We all were waiting for the elephants to cross the road, but they probably were scared. After a long patient wait, a single elephant came out from the thicket and ran over to the other side (he seemed nervous). After a few moments, an extremely cute young calf followed by its mother also crossed the road. It was amazing to see them so close. This incident gave the sense of adventure which we had missed because of not being able to enter the forest. 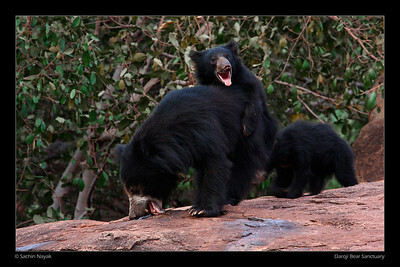 It was probably the high point of the trip to Kabini. The treat was not over yet. 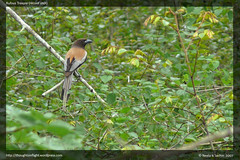 On the road from Kabini to Mysore, we got the much awaited sighting of two Long-tailed Shrikes. We spent some 15 minutes with them before moving ahead. Some more BSKs and Rollers could be seen along Mysore road. We took a 20 minute diversion into Ramnagaram and said hello to the Long-Billed Vulture there. As a bonus, we got to see an Egyption vulture perched a short distance away from the LBV which took off in a few minutes. A wonderful weekend came to an end. The beautiful sceneries, the excitement of spotting so many birds and the amazing time we had will keep the memories of this trip fresh for a very long time.